Review: Director Morgan Neville's Fred Rogers Doc. "Won't You Be My Neighbor?" So accustomed are we to the downfall and disgrace of men that a marvelous sense of its absence propels the rich and glowing documentary "Won't You Be My Neighbor?" Fifty years after he made his public television debut, Fred Rogers remains aloft: a pure and gentle soul never befallen by scandal, a still-shining beacon of kindness without the near-requisite dark shadow. "Won't You Be My Neighbor?" — as snug as a worn sweater — is hagiography. But it's deserved hagiography. And thank the lord it's not an expose. 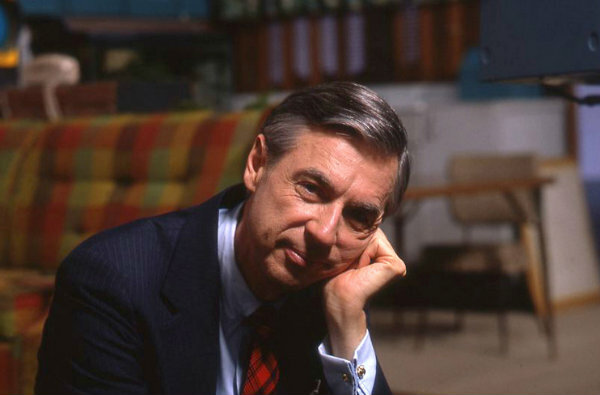 The film, directed by Morgan Neville, uses behind-the-scenes footage from "Mister Rogers' Neighborhood," archival video of Rogers and copious talking-head interviews with his collaborators and family members, including his wife, Joanne, and their two sons. It's an affecting window into what remains very possibly the most benevolent broadcast ever regularly beamed out on the small screen. As unique as "Mister Rogers' Neighborhood" was in its own TV era, Rogers would seem downright extraterrestrial on today's cable menu. Not long after Neville plays a snippet of Fox News where pundits bemoan Rogers for coddling a generation by teaching them that everyone is special, a former worker on "Mister Rogers' Neighborhood" wonders if there's room today "for a nice person on TV." Calling forth Rogers today — and that plain, tender and disarmingly straightforward voice — is both a reminder of the mammoth loss (he died in 2003) and how sadly bereft we are of anything like him. Many of the battles Rogers was fighting — against the "ever-ready molders" of children, against mass entertainment made without compassion — are simply no longer waged. What would Rogers — whose ire was raised by Superman movies that made kids think they could fly — make of an entertainment landscape where superhero blockbusters are billed as family entertainment? Rogers spoke of the "holy ground" between a young viewer and the TV screen. Today, it's mostly just a battle ground. But where, on Earth, did he come from? In the documentary, Rogers does sometimes smack of something alien, most of all when Neville relates how Rogers claimed he weighed 143 pounds every day of his adult life. The numbers, he felt, corresponded with the letters in "I love you." The answer, of course, is that Rogers came from outside Pittsburgh, and he was on his way to seminary before his first blush with television changed his trajectory. An often ill child (Rogers had scarlet fever) who was bullied as "Fat Freddy" for being overweight, Rogers was left, as he says, "to make up a lot of my own fun." The hand puppet Daniel Striped Tiger would eventually become a kind of outlet for Rogers' own fears and anxieties. But he also emerged from his youth with a profound sensitivity to the slings and arrows of childhood. "Won't You Be My Neighbor?" opens with a home-video clip of Rogers sitting at a piano in 1967 (a year before "Neighborhood" debuted nationwide) describing how he'd like to "help children through the difficult modulations of life." "Love is at the root of everything," he says later. "Love or the lack of love." With these simple beliefs — love yourself, love your neighbor — Rogers made a quietly revolutionary show. He spoke about divorce and tackled racism. To show what a minute was, he patiently let an egg timer tick it off. To help children understand the world they were growing up in, he spoke frankly, without condescension, about traumatic events. His advice for the most horrific disasters still regularly goes viral: "Look for the people who are helping," he said. He wasn't perfect. Francois Clemmons, who played Officer Clemmons, recalls Rogers telling him that he couldn't go to gay bars while making "Mister Rogers" — that while he didn't judge his sexuality, Clemmons couldn't be "out." Clemmons still considered him a surrogate father. Later, more awkward questions were put to Rogers (Tom Snyder asked him if he was "square") and protesters demonstrated at his memorial service against his tolerance for gay people. "Won't You Be My Neighbor?" ultimately doesn't dig much into who Rogers was. He remains unknowable for all his sincerity. One of his sons notes how it was "a little tough for me to have almost the second Christ as my dad." A movie starring Tom Hanks as Rogers, due out in fall 2019, probably won't do more to bring him down to Earth. Neville instead leaves us Rogers' simple and earnest message, and a final note of reflection on the people who shape our lives. Or as the song goes: "Won't you be mine, could you be mine?" "Won't You Be My Neighbor?" is a Focus Features release. It is rated PG-13 by the Motion Picture Association of America for "some thematic elements and language." Running time: 94 minutes. Three stars out of four.